While printing from woodblocks, and later from moveable type, had been developed in China and Korea around the 11th century AD, the first European printing from moveable metal type did not appear until the mid-15th century with Gutenberg’s press. This was a ‘one pull’ press, which required two separate runs through the press to print a double-page spread. Thus to print four pages of a bible, for example, two on either side of a leaf (sheet of paper), required four runs through the press – a very laborious and time-consuming business. The two-pull press (see below) made the printing process more efficient. Metal type was cast by a typefounder in a type mould, the metal body of which was made in two parts. When closed, hot metal (an alloy of lead and antimony) was poured in; this immediately solidified into a piece of type. Prior to this, the positive of the letter to be cast was sculpted from a steel bar, which was then struck into a bronze matrix to create the negative form of the letter. This matrix was fixed into the mould, the two halves of which were held together with wire spring-clips. Once the matrix had been made, it could be re-used in the mould almost indefinitely, so type could be mass-produced. The type was set by a compositor, using a composing stick to build up lines of type into spaced words, and these lines of type were then transferred to a tray called a galley to create complete pages. Impression proofs, called galley proofs, were printed at this stage to check the typesetting for accuracy, so that corrections could be made where necessary. Each corrected page was then transferred to a metal frame, called a chase, and the type locked in with wooden sticks, called ‘furniture’, and wedges (quoins). A chase complete with locked-in type, ready for printing, was known as a forme. This was set onto the flat stone in the ‘coffin’ of the press, which was part of the carriage assembly, and locked into position. The printing press was normally operated by two men, who inked the type, dampened the paper, fed it into the press (see tympan and frisket below) and removed it, and pulled each impression. The type was inked up using ‘ink balls’, wooden-handled, horsehair-filled, soft leather dabbers. The ink was picked up off the ink slab with a circular rolling motion, and applied to the type with a similar motion. To keep the leather soft and supple, it was steeped in urine. Dampened paper was then laid on a tympan frame, held in place with a parchment frisked. The frisket had windows cut into it which corresponded to the areas of type to be printed. The tympan was then folded down onto the carriage, which was then wound horizontally under the vertical platen. A pull of the handle would lower the platen onto the tympan, applying pressure to this which in turn would press the paper against the inked type. In a two-pull press, such as the common press, the platen would then be raised, the carriage be wound along further, and the printing process repeated for the facing page, thus both pages of a double-page spread could be printed in two successive pulls. Before printing on the reverse of the paper, the paper had to be hung up for the ink to dry, after which it could be dampened again and printed as before. Printed pages were then collated in their ‘signatures’ or sections for binding. The binding process was essentially the same as that which had been used for centuries for manuscript volumes. The printing press spread the words of the vernacular bible (Gutenburg’s first printed bible appeared in Germany about 1455), and had encouraged a more literal translation and interpretation. Wycliffe and the Lollards had spread their message through the south of England. William Caxton, the first English printer, saw a press at work in Cologne, and set up his own press in Bruges in 1473, which printed his first book in the English language, and in Westminster in 1476.The printing trade grew rapidly during the next two centuries. In 1538 Tyndale’s new translation of the Bible appeared in every church in the country. William Lee (1713-86), a native of Chichester, published and printed the Lewes Journal from 1745, and was joined for a few years by Verrall. [see Georgian Lewes, p124. Verrall had been paid by the Borough to print notices during the smallpox outbreak of 1731]. Lee was the founder and printer of Lewes’s weekly newspaper, the Sussex Weekly Advertiser; or, Lewes Journal, was, with Paine, a member of the Headstrong Club. Coloured by Whiggery and republicanism, the Journal reprinted the letters of ‘Junius,’ attacking the government. Other articles criticised the British state and its colonial system, ‘Tory tormenters,’ English despotism, the nobility, the gulf between rich and poor, superstition (in the name of ‘liberty of the mind,’ ‘plain truth’ and ‘common sense,’ and praised public virtue. Lee was a great supporter of Wilkes, whom he viewed as a ‘great patriot.’ In August 1770, Wilkes passed through Lewes, where he was given a hero’s welcome with pealing bells and applauding crowds, and it is possible that Paine met him on this occasion. All raised the cry of ‘Wilkes and Liberty,’ evidence that Wilkes’s appeal to the people and the ‘rights of electors’ met with popular support. By his raising the question of rights, Wilkes had brought into the area of public debate the crucial issues of the basic rights of the people (i.e. the King’s subjects), the relationship between the electorate (at that time only a tiny proportion of the population) and its representatives, and public influence on the structures of government and the constitution. No bounds, but those of right and truth, confined. From the black edicts of the tyrant grave. Paine was reputed to have ‘perseverance in a good cause and obstinacy in a bad one,’ and perhaps some of his conceit arose from the acclaim he received for his performances at the Headstrong Club. During his time in Lewes he also developed his writing skills, and he was the author of several pieces in the Lewes Journal. Lee carried out a certain amount of printing for Paine, notably The Case of the Officers of Excise. Paine was dismissed from the Excise Office after he published a strong argument in 1772, while living and working in Lewes, for an increase in pay as the only way to end corruption in the service. Excisemen were underpaid and disgruntled, and he had been asked to state their case in a petition to Parliament. They wanted not only more pay and better conditions of work, but the right to organise among themselves and to criticise their employer – the Crown. In the summer of 1772 he wrote several documents in this vein, and in late November or December he went on leave to London. Here he spent three months lobbying MPs and others to further the Excisemen’s cause, using as his headquarters the Excise Coffee House in Broad Street. With sympathetic colleagues he circulated copies of the single sheet tract, A Letter concerning the Nottingham Officers, and a 21-page pamphlet entitled The Case of the Officers of Excise, 4,000 copies of which were printed at William Lee’s Lewes Journal office. Lee also printed the Letter, a leaflet and a petition. Paine sent a copy of The Case of the Officers of Excise to the playwright Oliver Goldsmith, a man of radical leanings, and the two became good friends. Goldsmith had already written a biography of Voltaire, and The Deserted Village, a critique of a society ‘where wealth accumulates and men decay.’ Most of the 3,000 English Excisemen signed the petition, but Parliament rejected it outright. When he returned to Lewes in April 1773, he found that he had lost his job. The following year he emigrated to America. The Press is open to view from Tuesday to Saturday, 10am to 5pm. It may be in use when you visit, or demonstrations of 18th century letterpress printing can be arranged by appointment. The Gallery is home to the Tom Paine Printing Press, and has monthly exhibitions of work by contemporary printmakers. The shop stocks a wide range of Press publications, cards, prints and a selected range of books about typography. 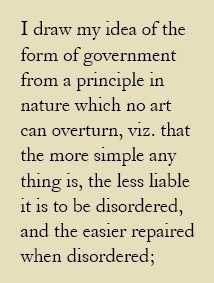 The text above, from Paine's 1776 'Common Sense', is set in Caslon Old, an 18th Century typeface.